Obama: Your Question, Ms. Keith? : It's All Politics I had been NPR's White House correspondent for four months. On Thursday, I asked my first question at a presidential press conference. This is how it happened. 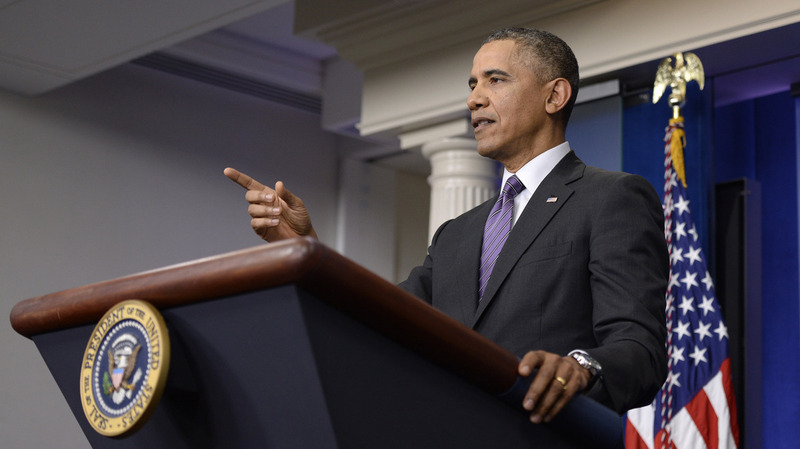 President Obama speaks in the White House briefing room Thursday. I officially became NPR's White House correspondent in January. But the job didn't seem real until Thursday at 3:56 p.m., when the president of the United States looked down at a white note card and said "ahhhh, Tamara Keith." That was my cue to ask a question — my first at a presidential press conference. 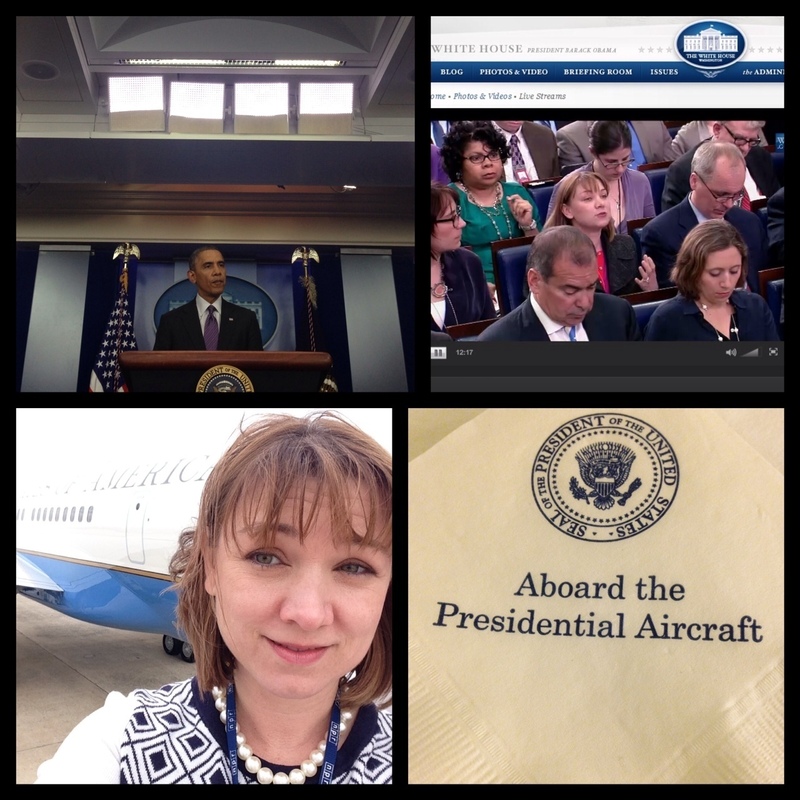 Snapshots from a NPR White House correspondent's life. That's Tamara Keith's Air Force 1 selfie (bottom left), and her asking the president a question at Thursday's press conference (upper right). Here's what the experience felt like — and how it happened. Almost every day, White House press secretary Jay Carney holds a briefing where he takes questions from reporters. Sitting in NPR's seat in the second row, taking notes and asking a few questions is a regular part of the job. Truth be told, it's not all that exciting. The briefings drag on, lots of people ask the same question in just slightly different ways, and I can count on an e-mail from my dad or a friend telling me my hair was out of place or I had a strange look on my face. But by early Thursday afternoon, it became clear that this briefing wouldn't be like the other briefings. First, there was an e-mail saying it would be delayed until 3:15. Then came another e-mail from someone in the White House communications office asking if I was planning to be at the briefing. This was a sign. The president was probably coming to the briefing, and he was probably going to call on me. I e-mailed my NPR colleague Scott Horsley, a veteran of the White House beat. Was I interpreting this right? Yes, that's how this works. Staffers needed to know which name to write on the president's white note card. My skin was suddenly warm, in that cold sweat nervousness kind of way. There was no guarantee I would get a question in — and no guarantee the president was even coming to the briefing. Still, I needed to prepare. I polled my colleagues to see if they had any pressing questions, and wrote up about five of my own. Then, I went for a walk. Clearly, I wasn't the only one who had seen the clues. There was a flurry of activity in the briefing room, a kind of nervous energy that simply doesn't exist for a Carney briefing. A man stood on a ladder adjusting the lights near the podium. Normally reporters wait until we get a two-minute warning before rushing into the briefing room at the last moment. Not this time. When I went to take my seat, the room was already packed and it was still at least 15 minutes away from the usual warning. Another clue: The male TV correspondents in the front row were wearing make-up (which they often don't do for a regular briefing). As we waited, I snapped a picture of the podium — with the presidential seal suddenly affixed to the front. The president was definitely coming. What I didn't know was when he would call on me ... or even if he would. Obama opened with remarks about the Affordable Care Act reaching 8 million insurance sign-ups through government marketplaces. I looked down at my list of questions and added another one related to the health care law. My outline also included questions about Ukraine and immigration reform. Obama pulled the notecard out of his jacket pocket. Q Since you brought it up. (Laughter.) I think everyone agrees that it has flaws. But Democrats have been sort of reluctant in Congress to reopen the conversation, and Republicans have been more than happy to reopen the conversation but in a different way. Now that, as you say, it's here to stay, there are so many people that signed up, in this environment is it possible to do the kind of corrections that the business community and many others would like to see — sort of small, technical corrections? "Let's see who we got," he said. The first question went to the L.A. Times and the reporter asked about Ukraine. Then it was on to a reporter from La Opinion, who asked about immigration. After that, Obama called on me. I was more than a little shocked that he pronounced my name correctly, given how often people get it wrong. But there wasn't time for that. The president had just called on me. I had to ask a question. I sputtered a little, then decided to ask a health care policy question I had just thought up moments earlier. So much for all that preparation. There are certain milestones as a White House correspondent, that make this very big, high-profile job feel real. Signing off from the White House for the first time. Taking your first flight on Air Force One. And the rite of passage of asking your first question at a presidential press conference. I can now say, I've done all three — and I have a selfie, a couple of screen shots and a press conference transcript to prove it.